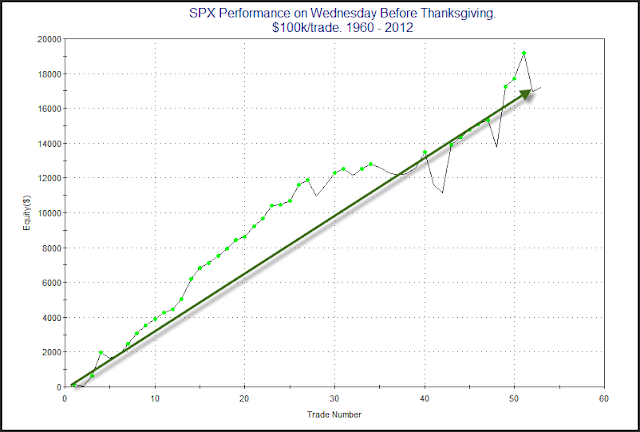 Thanksgiving has shown some pretty consistent seasonality over the years. On Monday I showed a table breaking returns down by day of the week. Both the Wednesday before and the Friday after have exhibited bullish tendencies while the Monday after has been somewhat bearish. Today I decided to show a profit curve that represents simply owning the SPX from Tuesday's close through Wednesday's close. Appears to be an impressive looking upslope. Happy Thanksgiving! 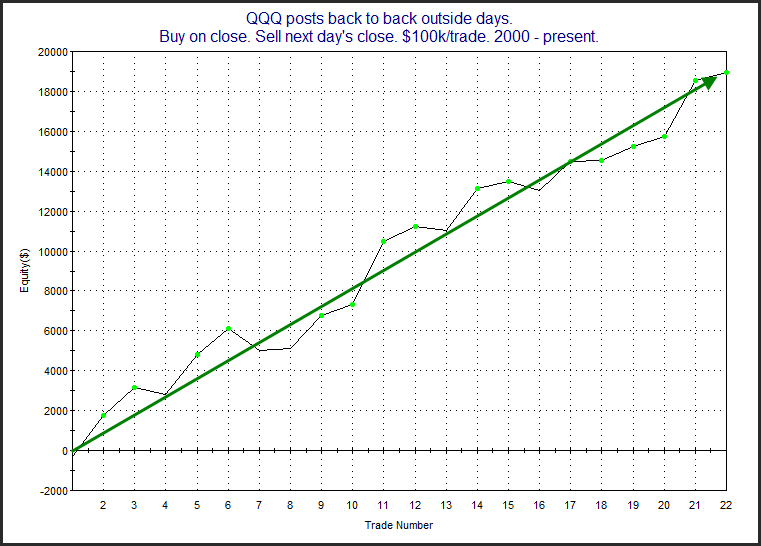 QQQ made both a lower low and a higher high on Wednesday versus the day before. That is often referred to as an “outside day”. Outside days are not terribly unusual. What is unusual is that it happened fort eh 2nd day in a row. In the past the simple fact that range has expanded for the last 2 days has led to a short-term rally. I last showed this in the 8/22/12 blog. Below is an updated results table. The numbers all appear impressive. I also produced an equity curve that assumed a 1-day holding period. The persistent upslope is impressive and it serves to confirm the upside edge. SPY Registers 1st 5-day Low In A While - Now What?